Digital photo frames? Errrrrrrrm, MEH. 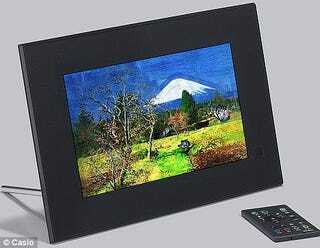 Casio's Digital Art Frame, however, I could almost write a QVC script for. It takes your own digital photos and transforms them into paintings - well, it turns them into digital images with special effects. There are, apparently, eight art form effects, including oils, pastels and watercolors, and the frame also plays audio files and videos. But let's focus on the pictures for the moment. I reckon you wait for Digital Art Frame 2.0, which will be able to turn your pics into Van Goghs, Velazquezes, Reubens, Basquiats, Picasso, Johns and the like. Oh, and the guy who did the Dogs Playing Poker pic.